This month’s rehabilitation lesson kit will definitely put a smile on your face. This month’s lesson kit focuses on using faces and facial expressions to build listening and communication skills. In this free aural rehabilitation download, you’ll find almost 40 pages of detailed lesson plans and illustrations, so check it out now! New to our themed lesson kits? If you’re an audiologist, speech & language therapist, rehabilitation specialist, or any other professional that works with children with hearing loss, these aural rehabilitation resources are made for you. This aural rehabilitation lesson kit is themed “Faces and Hands” and is a great way to use facial features, facial expressions, senses, and emotions for aural rehabilitation. In this lesson kit, there are drawing lessons, themed board games, and lots of fun matching activities. We’ll post a new lesson kit for download every month here on our Professionals Blog. There’s no deadline for downloading these aural rehabilitation resources, so you can easily find and share previous lesson kits. Ready to get started? 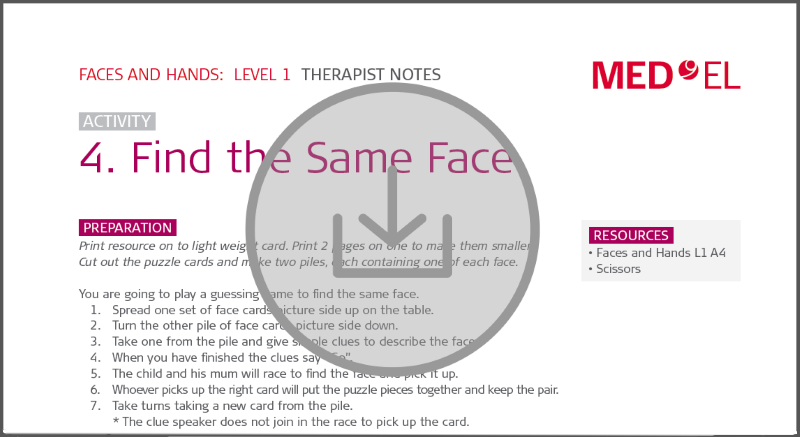 Download the “Faces and Hands” lesson kit pdf now! Let us know what you think in the comments below. And of course, we’re sure your colleagues would love these lesson kits—help them out and share today!